Ancient Order of United Workmen, Newhall Lodge No. 218. Notice published in the Los Angeles Herald newspaper, Jan. 12, 1886. Image courtesy of Jason Brice. Newhall Lodge No. 218, A.O.U.W. Brother R.W. Pridham on Saturday night installed the following officers of the above lodge for the ensuing term: P.M.W., H.B. Proudfit; M.W., J.H. Whitney; Treasurer, W.G. Lorbeer; Overseer, W.N. Parker*; Recorder, Matt McCormack; Financier, J.W. Myers; Receiver, B.R. Boynton; Guide, J.W. Skelton; I.W., J.B. Morrison; O.W., C.D. Reynolds; Trustee, J.B. Morrison; Medical Examiners, Doctors Turner, Orme and Shoemaker; Representative to the Grand Lodge, H.B. Proudfit. 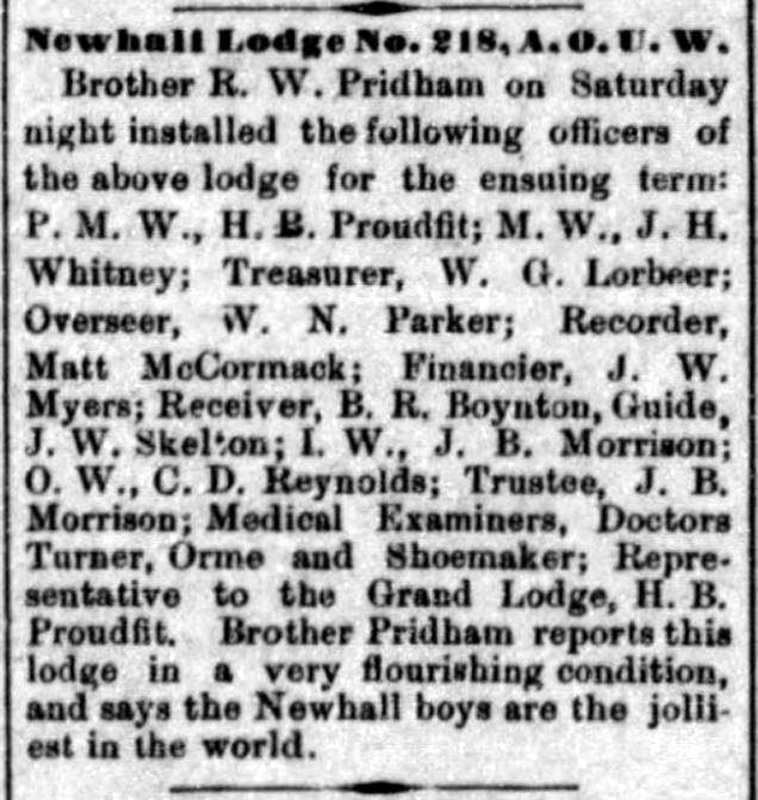 Brother Pridham reports this lodge in a very flourishing condition, and says the Newhall boys are the jolliest in the world. * Webmaster's note: This should probably be W.N. (William Nelson) Forker, who in the 1870s was a notary public in George Campton's Newhall general store and was related to the merchant by marriage. Forker was also Kern County's first oil commissioner. The Ancient Order of United Workmen was America's first fraternal or mutual benefit organization to the extent that it provided financial protection to its members in the form of insurance — life insurance at first, and later medical and other types of insurance. In the beginning, members paid $1 and their survivors received $500 when they died; the payout was soon increased to $2,000. When a member died, each member would pay another $1 to replenish the fund. According to the online Masonic Museum and Library, the A.O.U.W. was started by a Mason, John Jordan Upchurch, in Meadville, Penn., in 1868, shortly after the conclusion of the Civil War. It was a time of urbanization and industrialization. "(T)he railroads created the potential for national markets," and factories "created opportunities that tempted many people to move away from the farms, villages, and hamlets to pursue their fortunes in the growing urban centers." Advertisement for an A.O.U.W. 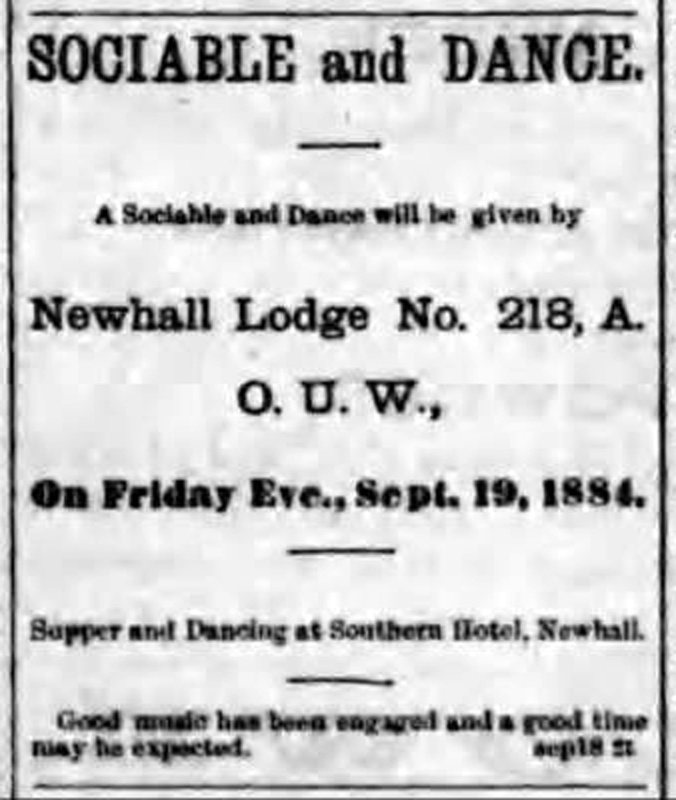 social at the Southern Hotel in Newhall, Sept. 19, 1884. Published the same day in the Los Angeles Herald. Image courtesy of Lauren Parker. Upchurch's idea was to adjust "all differences which may arise between employers and employees" for the benefit of both, in the belief that "the interests of labor and capital are equal and should receive equal protection." The initial members in 1868 consisted of mechanics, engineers, firemen and day laborers on the Atlantic and Great Western Railroad, and the merchants who serviced them. The organization used a lodge system, like other (later) fraternal organizations, and it used Masonic symbols including the all-seeing eye, the Bible, anchor and compasses. Its motto was "Charity, Hope and Protection." By 1885 the A.O.U.W. was the nation's largest fraternal organization; as of 1895 its national membership exceeded 318,000. In 1929 the organization's leadership decided to abandon the lodge system in favor of a national congress. Individual lodges disbanded; some morphed into life insurance companies. Newhall's Masonic order was established in 1922. It's likely that members of the old A.O.U.W. transitioned to the new organization, which initially met at the Chevrolet dealership on Spruce Street in Newhall (now known as 24374 Main St.).